Oh wow – Kevin and Matt Dillon could be twins, not just brothers. When the kids are sucking up the jello – the scene and the kids and mom all look like an actual commercial from the era. The tailgate party this teenager has is epic! 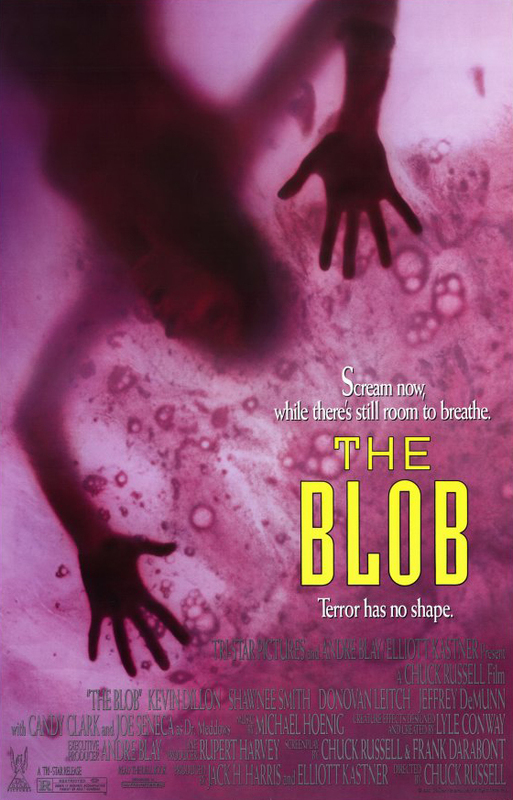 Is it wrong that I love the color of the Blob? This movie is the reason why the thought of cleaning out the garbage disposal terrifies me. And phone booths. And yoyos. Oh yeah, and sewers. And men in paper suits. Overall this movie reminded me of how great it was. It held up well for the cheesy horror genre of the 80s. If you have not seen this version, you should. Especially if you like horror movies. IMDB Synopsis: Remake of the 1958 sci-fi horror classic about a deadly blob from another planet which consumes everything in its path. Teenagers attempt without success to warn the townspeople, who refuse to take them seriously. It received a Rotten Tomatoes rating of 68% Fresh. It received a Rotten Tomato audience rating of 52% liking it. Average Rating: 3/5 with a number of User Ratings: 31,594. Of the film’s US$19 million budget, US$9 million went toward visual effects. Theatrical trailer shows part of deleted scene in which Fran is chased by the Blob through the restaurant. In this deleted scene she is running towards the doors while the Blob is knocking down tables and chairs. When she gets to the doors she realizes that they are locked and that she doesn’t have a key so she jumps out of the window. Another scene was filmed but deleted in which Blob kills and eats a squirrel. Also, some versions of the movie had alternate death scenes of Paul and Eddie, with different editing (Paul’s death) and different gore effects (Eddie’s death). All of the exteriors for the movie were shot in a small south Louisiana town called Abbeville. Abbeville is laid out almost exactly the same as Arbeville, Colorado, where the movie takes place. Abbeville was used because filming took place in late 1987 and Arbeville was covered in snow. It’s just a weird coincedence that the names are so similar. The partially-dissolved-but-still-alive soldier was performed by stuntman Noble Craig, a triple-amputee who lost both legs, an arm, and an eye while serving in the Vietnam War. The blob’s first victim, the homeless man, is credited as “Can Man,” a reference to the STAND character “Trash Can Man.” Trash Can Man was Randall Flagg’s most devoted follower; in this film, Can Man shares nearly all his scenes with Brian Flagg. Body count: at least 16 (this includes three people in the theater audience; the total number of people killed in the theater is likely more).